The NCAA has determined that the University of Connecticut committed a secondary rules violation because of a phone call between women’s basketball head coach Geno Auriemma and Mo’ne Davis, a pitcher for a Philadelphia-based team in the 2014 Little League World Series. Davis, who is entering the 8th grade in the 2014-15 school year, also happens to be a basketball fan. In fact, she said that her dream was to be the point guard for the UConn Huskies. Davis even had a chance to watch the Minnesota Lynx play against the Phoenix Mercury during the Western Conference Finals. So, Auriemma talked to her for two minutes, after consulting with the Little League’s communication office. Then, soon after, another school in the AAC turns him in for trying to recruit an 8th grader who is SO GOING TO UConn in 2015! OH NO!!!!!!! Under normal circumstances, I would probably not know anything about her until she was in ninth grade. I have no idea if the kid is very good, kind of good, not good at all or a superstar or can even reach the basket. How is that a violation? So what does this mean? If a kid wins a swimming contest somewhere and is wearing a [UConn] sweat shirt and I call to congratulate her in seventh grade, is someone now going to say you are not allowed to do that? Well, why not? Isn’t that unbelievable? There are guys playing college basketball driving around in cars worth more than my house and we’re worried about a phone call to a little girl? 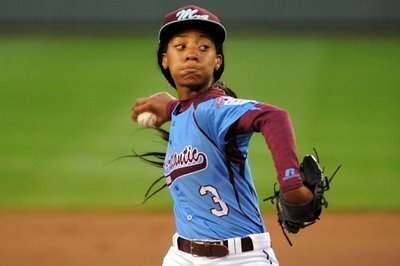 Over the last 24 hours, the University of Connecticut, the American Athletic Conference and the NCAA have been working together to determine whether a violation occurred when head women’s basketball coach Geno Auriemma spoke with Mo’ne Davis over the phone during the 2014 Little League World Series. The NCAA has determined a secondary rules violation of bylaw 13.1.3.1 did occur and while UConn accepts this decision, we do not agree with it. Prior to attempting to reach Davis, Coach Auriemma checked with the UConn compliance department and was advised such a call would be permissible since Davis is not considered a prospective student-athlete by the NCAA and the call was to be congratulatory rather than recruiting in nature. While UConn will continue to adhere to the NCAA and conference rules, I believe that upon request from a friend to Geno, a proud Philadelphian, to call a young lady representing the City of Brotherly Love who had accomplished historic feats in the Little League World Series, should not constitute a violation especially due to the fact that NCAA rules do not classify Mo’ne as a prospective student-athlete. The nature of Coach Auriemma’s two-minute conversation with Mo’ne had nothing to do with recruiting and instead had everything to do with congratulating and encouraging Mo’ne to continued success. I consider this matter closed and we will have no further comment. Because this is a secondary violation, don’t expect the NCAA to take away scholarships and wins away from the UConn Huskies’ women’s basketball program. It’s more likely that the University and Geno Auriemma will get a nasty-worded letter about talking to an eighth grader for an accomplishment that has nothing to do with basketball, and really, I have no idea how good Davis is on the court. So I’m siding with Auriemma here. I get that recruiting needs to be a fair process, and no school should try to get an unfair advantage, like boosters paying recruits money, etc. But this is ridiculous. To the school that snitched on UConn for this EGREGIOUS act, in the name of the integrity of the Almighty NCAA … congratulations for making something out of nothing!